Big protection in a Mini CPR Mask backpack that's what you get with this portable and sensible CPR First Aid kit. The fasten-to-your-belt design is small enough to go virtually unnoticed but big enough to hold the CPR essential basics. Attach these to your belt and you'll carry lifesaving protection wherever you go. Includes exam quality gloves and antimicrobial wipe. Mini CPR Mask backpack measures 3-1/4" X 4" X 1-1/2". 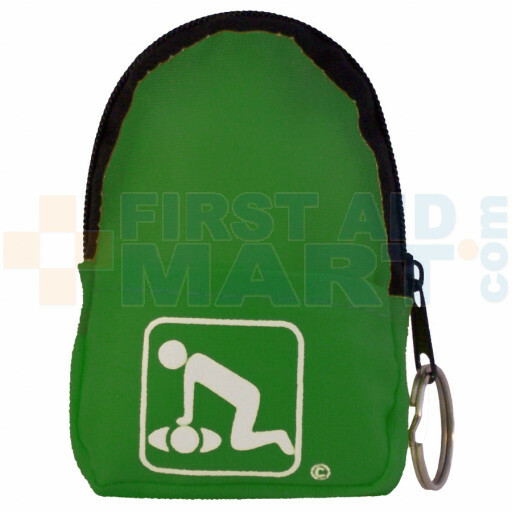 CPR Green Belt/KeyChain BackPack:Shield-Gloves - 911CPR-LGK.